This time of year we receive a lot of questions about using ContactEase to manage the holiday card process. Amber Elliott, Director of Client Services at ContactEase, might understand the process better than most. As a law firm marketer, one of Amber’s favorite ways to get through the holiday card season was by grabbing a peppermint mocha and cranking up the holiday tunes. “It’s hard to feel anything but happy with that combo,” she says. And while she’s no longer working in a law firm, she’s still enjoying her peppermint mochas and music as she consults with clients on holiday card best practices — she just has to turn the music down during those conference calls. After you learn how some of our favorite legal marketers manage the holiday card process at their firms, be sure to keep reading for information on our industry-wide survey of law firm holiday card practices and how you can get a free peppermint mocha (or beverage of choice) to see you through the holiday season! How does your firm manage the holiday card process? Does your firm do something unique to celebrate the holidays? We’d love to hear from you! Don’t forget about our survey on law firm holiday card practices! We want to hear from lawyers and marketers to understand the importance of holiday cards, what firms are doing, and how opinions differ between lawyers and marketers. Your time is valuable, and so is your insight! We’re offering a $5 Starbucks gift card to lawyers and legal marketers who answer our survey between now and the end of the year. We’ll publish the results in a white paper to be released next year. Please visit https://www.surveymonkey.com/r/HolidayCards to take the survey. It should take about three minutes to complete. Feel free to share the link with other law firm marketers and lawyers who may have an interest. We plan to summarize these results in an upcoming white paper and will be happy to share the results with anyone who participates. If you’ve spent any time with our Director of Support & Technology, P.J. Sawchuk, you know how passionate he is about food. As it turns out, that extends to his family as well! One of P.J.’s favorite holiday traditions is the Feast of the Seven Fishes. This Italian-American tradition is a celebration on Christmas Eve that typically includes fish and other seafood. What’s your favorite holiday tradition? Let us know in the comments! Did you know there are only 33 more days until the first of December? No it is not a trick (and probably not a treat) but with Halloween this week we thought it would be a great time to check-in on your holiday card progress. If you have not already started it is not too late. To help you get an idea of where you should be at in the process, we have come up with a suggested timeline below. This is only a suggested timeline to help guide the thought about what needs to be executed on. Depending on the complexity of the firm it could take more or less time to complete. No matter the length of the process there is one last step that is often overlooked… celebrate! Celebrate the project completion. It is a large undertaking and requires a lot of coordination. Enjoy the success with your team, thank those who helped with the execution such as the IT department and the assistants, and make sure to share the news with the entire firm. Send out an internal memo with the card and share tracking numbers or feedback that you have received. 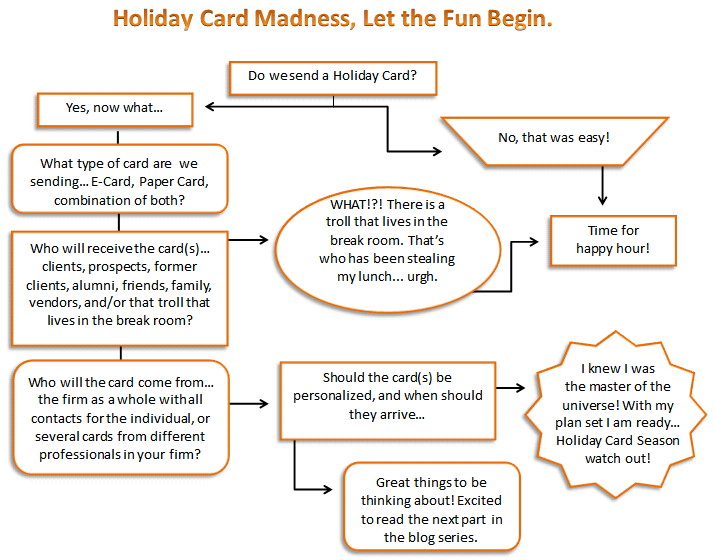 Let us know what you think… what other steps does your firm build in and when do you start your holiday card process? By sending an e-card your firm can identify who has received a card and what action they took. The number of people who opened the card can be tracked identifying if the e-card was successful and worth the time put into the project. Marketing and business development initiatives could be launched and the click-throughs to additional messaging or promotional items can be identified. Those activities could then be added to the database and depending on the call to action there could be very specific follow-up items assigned. Opting to send an e-card helps your firm clean-up the database. If a contact at a client leaves and the firm doesn’t know about it, it could become lost work if the firm doesn’t have any other contacts there. By tracking bounce backs and failed emails someone can look in the database and see what other contacts or relationships the firm has with the client and alert the firm of potential at risk clients. When sending an e-card consider having contacts update their own information and which communications they would prefer to receive. With ContactEase this could be done by using our Online Client Update Form. Ask contacts to take a minute to review their data and make any changes necessary by providing the hyperlink to do so. The data is then cleaned up in the database and your firm has the most up-to-date information for a contact and contacts can opt for the communications that matter the most to them. Within the e-card create a mini campaign of some sort through calls to action. If you have a Facebook Page or Twitter account your firm is trying to expand, create a perk for people to “like” or “follow” you. One firm did this by letting their contacts know that they had decided to use the money previously spent on physical cards and donate it to a local charity. For every follower they received they would donate X amount of money up to a certain dollar amount. They were giving back to the community while expanding their audience reach. If you are spending the time and money associated with doing a holiday card it is important to identify what your key objective(s) are. If your firm is simply sending a card for warm wishes, think through the above points and how the card could be used more strategically for your business development and marketing initiatives. It may still be shorts and t-shirt weather, but the dreaded season of “Holiday Cards” is just around the corner. The best way to prepare is to plan for the inevitable sooner, making the project easier as the time approaches.The first step is to determine what your firm’s intentions are for this year’s annual Holiday Card. Some firms are satisfied with an e-card that goes to all of the clients, prospects, former clients, alumni, vendors, etc. with a generic, “From your friends at Smith & Jones.” Other firms want a physical card signed by those who are directly involved with the client, a separate card per partner. While there are also dozens of variations in between, before you can make your holiday plans it is important to know exactly what your firm wants to do. Do we send a card at all? Are we going to do it the same way we did it last year? Only one card or will individual cards be sent? Who will be sent a card(s)? Will the card(s) be personalized? When should the card(s) arrive? So before the kiddies are back in school (because once the fall begins, time is short), you should nestle up to a patio with a cold lemonade and start making your Holiday Card plans. Use the list above to make certain that you know exactly what your firm will be doing. Then, once you know where you are headed and what is involved, it will be easier to see how ContactEase can be used to help in the process. Watch for future postings to help guide you through the Holiday Card Season, and remember it is never too soon to start. So READY, SET, GO! Start mapping out your firm’s plans now, so the process is easier in the long run.